The globalization of the world economy today means that more and more people are experiencing working in another culture. Focusing on the real experiences of workers in Japanese transnational finance companies, this book not only throws light on this specific case, but at the same time raises timely questions and insights concerning the newly emerging multicultural work experiences world-wide. 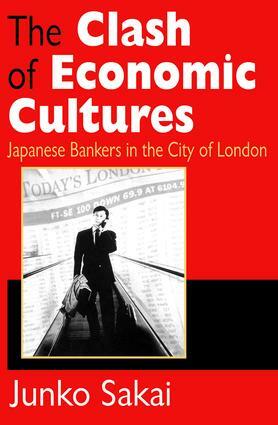 The Clash of Economic Cultures: Japanese Bankers in the City of London reflects on contemporary discussions in sociology, anthropology and cultural studies of individual global movement and cultural interaction. While there are some studies on Japanese multinational companies in Europe, they have typically assumed stereotyped differences in management systems and work cultures. This book, however, breaks the mold by looking at the culture and individuals' subjective views about their working lives and also their own worldviews; this perspective illuminates the difficulties in working relationships between Japanese and Europeans. Junko Sakai reveals, through 100 transcribed interviews, the influence of power relationships on people of different groups in terms of gender, class, and ethnicity. The Clash of Economic Cultures shows uneven transformation of economic and cultural hegemony between East and West. This book gives voice to Japanese men and women whose voices are rarely heard, and to the British who have worked for non-Westerners in the West. It is also a significant and timely analysis of the increasing influence of non-Western companies in London. It will be of great interest to cultural anthropologists, business historians, sociologists and scholars in Japanese and Asian studies, as well as those involved in international finance and management.